Warren Gamaliel Harding Crecy was born on January 4, 1923, in Corpus Christi, Texas. Those who knew him called him “Harding.” His wife, Margaret, and he grew up together. In 1935 when she was nine, and Harding was 12 he showed up at her house all done up, and a face scrubbed so hard it almost looked red. In one hand, he held a bouquet of flowers, and in the other a carton of ice cream – but they were not for Margaret. They were for her mother. Crecy announced he had come to ask for her youngest daughter to marry him when she reached 18. Nine years later, they did just that because he always did whatever it took to get whatever it was he wanted. Crecy enlisted in the Army nine months before Pearl Harbor. 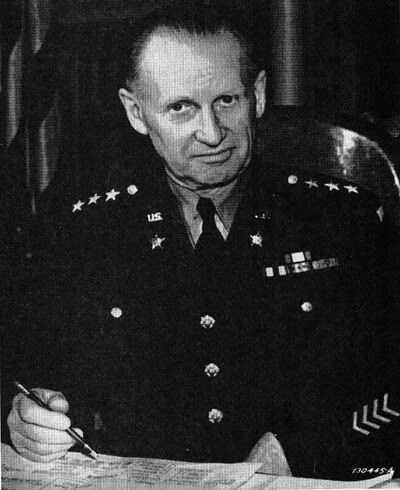 General Lesley J. McNair, the Commander of Army Ground Forces, wanted African-Americans to serve in combat. Most who joined the armed forces did so in supporting roles as cooks, cleaners, etc. McNair believed they should be allowed to fight if they wanted to as they had done in WWI and other conflicts. However, there was a problem. 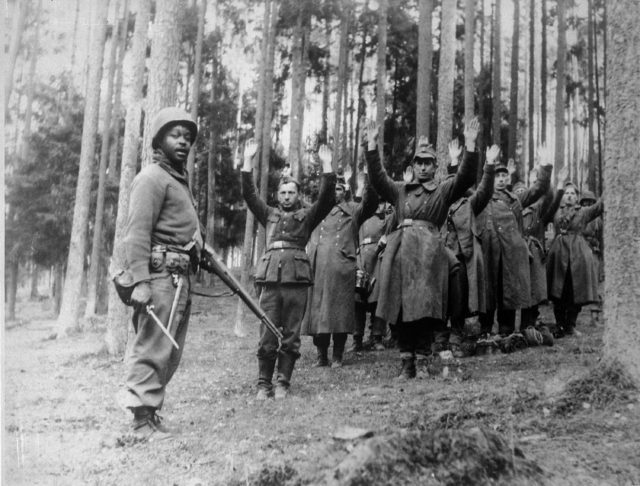 Federal law forbade blacks from serving with white troops. 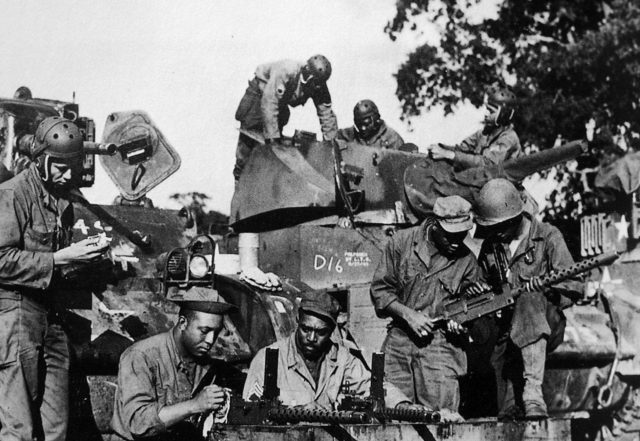 So the 761st Tank Battalion was born – an independent division of the US Army. “Independent” meaning they were a segregated unit under white officers. 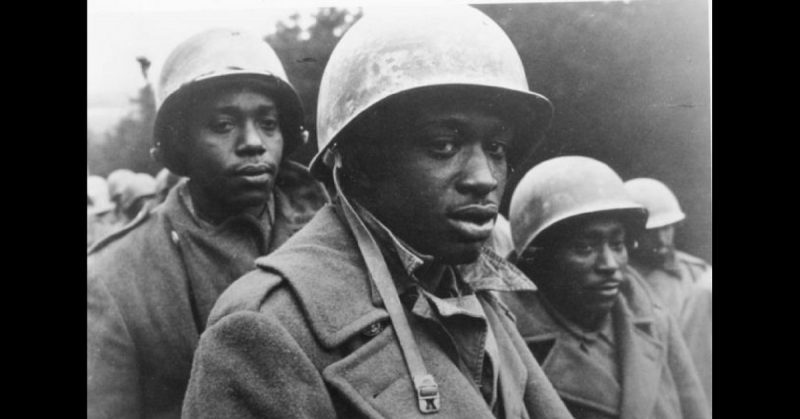 They were called the “Black Panthers” due to their logo and their motto was “Come out fighting.” They lived up to their motto, earning themselves several awards, including a Medal of Honor. 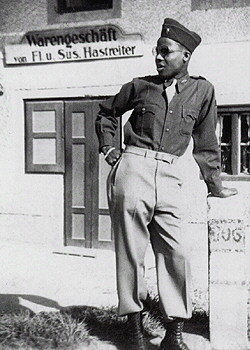 Among the Black Panthers who shined was Crecy; although his comrades thought he was crazy. Not that he looked it. Crecy wore horn-rimmed glasses and had “baby cheeks” with soft fuzz on his upper lip that never seemed to make it into a proper mustache. He was said to be quiet, polite, easy-going, and meek. They also say that still waters run deep. Growing up in the South where blacks were seen and treated as subhumans, his waters must have run deep, indeed. He already had a reputation. His tank driver, Corporal Harry Tyree, was nervous about his job because he claimed Crecy became another person once the fighting began. The 761st saw action on November 7, 1944, in the French towns of Moyenvic, Vic-sur-Seille, and Morville-lès-Vic. By the end of the month, they had lost 24 men and 14 tanks. Crecy often rode atop his tank, firing gleefully away at German soldiers, uncaring of how vulnerable he was while barking orders at Tyree to drive into the thick of battle. As a result, his superiors reprimanded him for reckless conduct, but never punished him for it. It was war, after all, and he was exactly the type of man they needed. On November 10, 1944, Crecy proved to everyone not only what kind of a man he was, but why the US military was wrong about his kind. It happened outside the commune of Morville in Normandy’s Manche department. He was with Dog Company when his unit came under fire which destroyed his tank. Jumping out of the burning machine with only a .30-caliber machine gun, he ran toward a machine gun nest and destroyed it. He then took out another position. The next day, he was in another tank doing screening operations when an infantry lieutenant of the 26th Division flagged him down. The officer wanted a lift through the woods and up to a hill to see the fighting. He believed a tank would improve his chances of reaching his goal alive. The going was rough. Heavy snow lay on the ground, and as American tank treads were narrower than German ones, they kept slipping and sliding on the snow, sometimes getting bogged down. It got worse as they made their way up the hill. They had just broken out of the tree cover near the summit when the firing began. Crecy, still riding exposed on the tank’s top, ordered Tyree to back up into the woods. Tyree did so… straight into an anti-tank ditch covered by snow. The tank’s rear stuck up in the air, exposing its underbelly to enemy fire. Ducking back inside, Crecy radioed for help, and another tank arrived minutes later. Braving intense enemy fire, Crecy jumped out of the hatch, ran to the other tank, and attached a winch to tow his tank out of the ditch. When the other tank had pulled him out, he climbed back in just as an AP shell bounced off the right side of its hull. Tyree tried to move back into the tree line, but the tank would not budge. German soldiers were pinning down the infantry unit behind the rescuing tank, so Crecy jumped out and again mowed down the enemy. 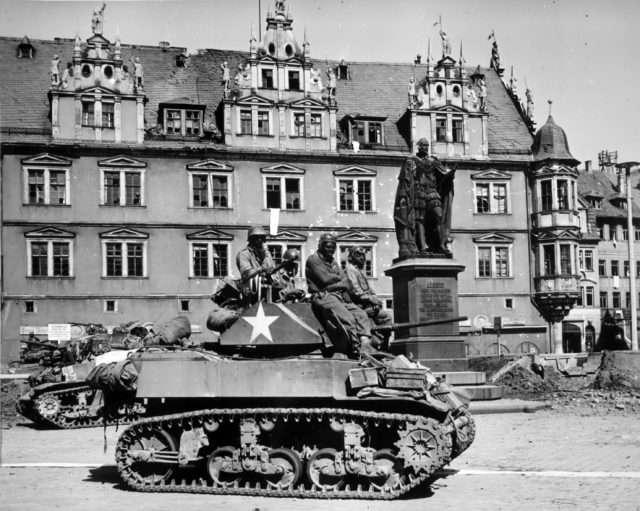 They got the tank out, but hours later, they came under fire from several machine gun nests. Seeing some of his friends get hit, Crecy went berserk. He destroyed two machine-gun nests and an anti-tank position. His unit had to pry his empty machine gun out of his hands. They called him the “Baddest Man in the 761st” after that and nominated him for a Medal of Honor. Not that they gave those to African-Americans, back then, so he received a battlefield commission and retired with the rank of major.